Invoice Classic is an invoice template on steroids and can be purchased from our PDF Template Shop. This guide will walk you through installing and configuring Invoice Classic to its full potential. Please follow our installation guide, which provides instructions for setting up and configuring your premium template. 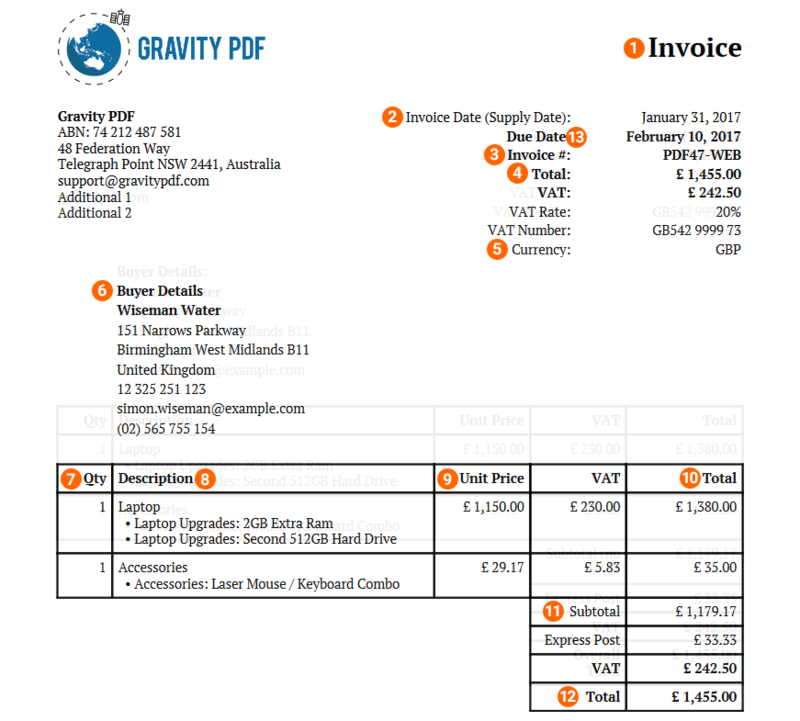 As an Invoice PDF template, Invoice Classic can be used with any Gravity Forms that include Product fields. You have access to your form data through Gravity Forms Merge Tags. For more information see the Gravity Forms Merge Tags documentation. All PDF templates have common settings that can be configured, such as font, security and PDF attachments. We recommend reviewing the PDF setup guide to get a better understanding on all the available settings. All template-specific configuration is done from the Template tab and below you’ll find detailed information about each option available in Invoice Classic, what it does and how it alters the generated PDF. This image is included at the top of the generated PDF invoice. It can be positioned left or right using the Logo Position option. An image 500px wide will be a suitable resolution in most cases. To ensure your PDF generates quickly and the PDF file size stays small we recommend using an image under 1MB. Change the logo positioning in the PDF. Supported positions are Top Left and Top Right of the document. The business address is split into three separate fields for each line it takes up in the invoice. There’s no need to enter your company name in the address. The Business Name field is automatically included just above it. Include your business registration number here (if any). In the US this is your EIN, in Australia your ABN and the UK your CRN. There are two contact fields where you can include your phone number, email address, fax or website. This is an optional field that is included before the Invoice Number on the PDF. 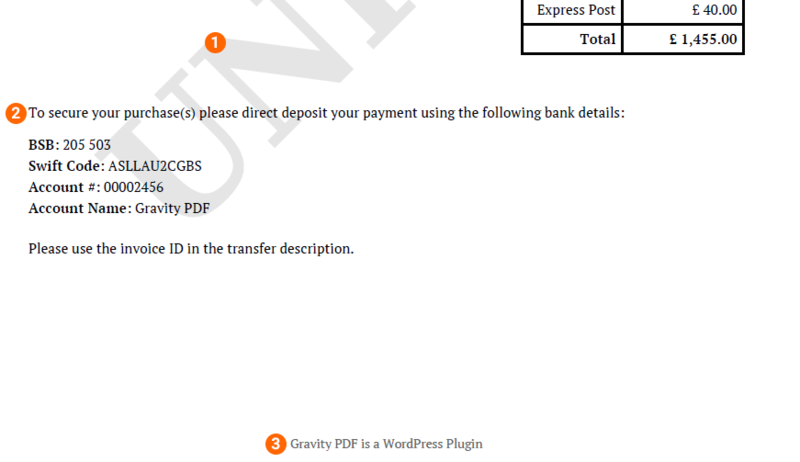 By default the invoice number uses the Gravity Forms entry ID. Be aware, this number is NOT sequential. If you need a sequential invoice number we recommend the Gravity Perks Unique ID add-on. This is an optional field that is included after the Invoice Number on the PDF. Select the date format that is shown on the invoice. The date shown on the PDF is taken from the entry submission date. Added in version 1.2, you can now set the due date in the PDF a specific number of days from the entry submission date. Set the due date to “0” to remove from invoice. The buyer information will usually be included using Merge Tags. Enter the name of the individual or company making the purchase. The buyer address is split into three separate fields for each line it takes up in the invoice. Include the buyer’s registration number (if any). In the US this is an EIN, in Australia an ABN and the UK a CRN. There are two contact fields where you can include the buyer’s phone number, email address, fax or website. With that said, you can take advantage of Gravity PDF’s Conditional Logic to set different tax rates based on a buyer’s address. By default, basic tax is disabled in the invoices. Tick this checkbox to enable tax. Enter the name of the tax being applied. For example, Sales Tax in the US, VAT in Europe and GST in Australia. This label is included next to the calculated tax in the invoice. The percentage of tax that should be applied to the invoice. For example, in Australia it’s 10%. This is label is shown next to the Tax Rate. By default, tax on shipping is disabled in the invoices. Tick this checkbox to enable shipping tax. 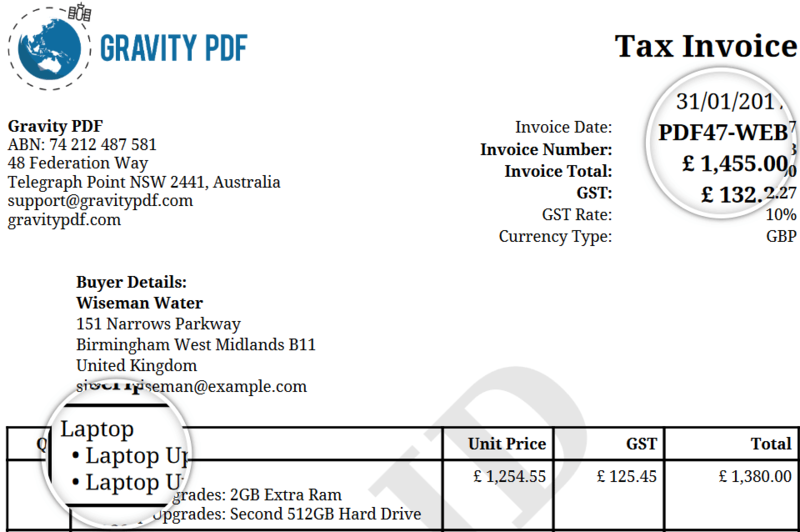 By default, the total tax is shown in the invoice summary section (the top right of the PDF). Tick this box to remove the tax amount from the summary. By default, a new column is added to the invoice table which shows the calculated tax for each line item. Tick this box to remove the column. Enter your company’s tax number (if applicable). For example, VAT-registered companies have a Tax Identification number which should be included. The label to be shown next to the Tax Number. This won’t be shown if the Tax Number is left blank. Optionally include a text watermark diagonally across the PDF. This content will be displayed below the product table. This is the perfect place to include payment terms, thank you note, or delivery instructions. This content is centre-aligned at the bottom of the invoice. All text in the PDF can easily be changed below. By default, the labels are displayed in English but you can easily translate them. Many elements in the PDF can be disabled by saving a blank label. 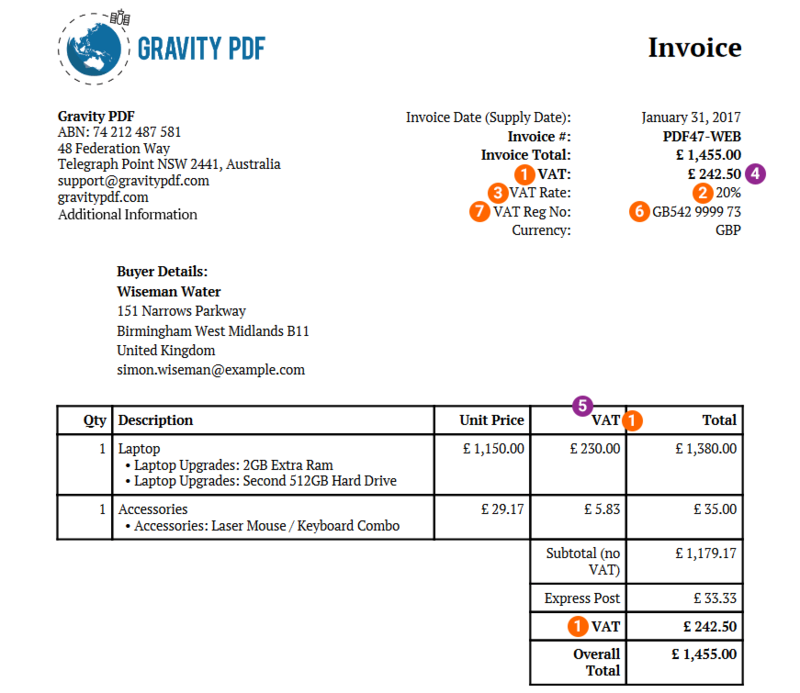 The invoice title that is displayed in the top right corner of the invoice by default. If the Logo Position is set to Right the label will be displayed on the left instead. The label displayed next to the Invoice Date. Leave blank to disable. The label displayed next to the Invoice Number. Leave blank to disable. The label displayed next to the Invoice Total in the summary section. Leave blank to disable. The label displayed next to the form’s currency in the summary section (eg. USD, AUD, Euro). Leave blank to disable. The label displayed above the buyer name and contact details. The label shown in the Product table header for the Quantity column (i.e the number of products purchased for each line item). The label shown in the Product table header for the Description column (i.e the name of the product purchased for each line item). The label shown in the Product table header for the Unit Price column (i.e the cost of a single product for each line item). The label shown in the Product table header for the Total column (i.e the total cost for each line item). The total cost for all products, excluding shipping. If tax is enabled the subtotal will also exclude tax. The overall invoice total including shipping, and tax (if applicable). The payment should be made by this date. Invoice Classic comes bundled with PT Serif which is an open source licensed font (SIL Open Font License, Version 1.1). PT Serif is a transitional typeface with humanistic accents. For the best results we recommend using PT Serif at 10pt. Set the PDF font in the Appearance tab. Once you’ve saved your new PDF you can view it from the Gravity Forms Entries List page. Just remember to fill out and submit your form if the entry list is empty.